Killer Chrome is simply the finest ground metallic pigment available anywhere. This assures a mirro-like finish every time! 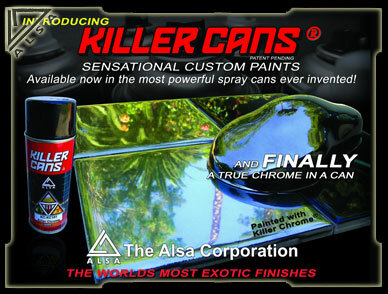 A far cry from other would-be chrome spray paints which do not deliver what they advertise. Ghost Chrome produces the most realistic Metallic Paint finishes available anywhere. PRE-MIXED CANDY COLORS IN A CAN! Simply shoot these over any other base color to create a deep, rich candy colored effect. Highly Metallic Basecoats proven as the most popular colors on the market. Coverage is the key! Stylin Basecoat heavy coverage formula eliminates the need for three or more coats saving you valuable time and material. Prizmacoat contains a unique pigment additive which is invisible in low light or shade, but EXPLODES into a myriad of colors and hues when viewed in sunlight or under direct incandescent light. The world’s most affordable color shifting paint Violet Dreams Speaker BoxMystic is a color shifting paint that has an extremely metallic type of look, yet it flops like no other paint we have ever seen.